186 in stock Need More ? 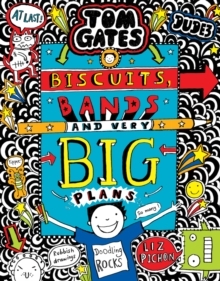 The bestselling fully-illustrated Tom Gates series is back with a new book! This book is VERY important because it contains BISCUITS, BANDS and all my (doodled) plans to make DogZombies the BEST band in the world. MY VERY BIG PLAN: 1. Write more songs about VERY important things like...... biscuits 2. Make sure there's a good supply of SNACKS for our band practice 3.